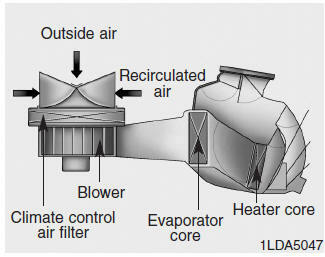 The climate control air filter installed behind the glove box filters the dust or other pollutants that come into the vehicle from the outside through the heating and air conditioning system. If dust or other pollutants accumulate in the filter over a period of time, the air flow from the air vents may decrease, resulting in moisture accumulation on the inside of the windshield even when the outside (fresh) air position is selected. If this happens, have the climate control air filter replaced by an authorized HYUNDAI dealer. Replace the filter according to the Maintenance Schedule. If the car is being driven in severe conditions such as dusty or rough roads, more frequent climate control filter inspections and changes are required. Because the refrigerant is at very high pressure, the air conditioning system should only be serviced by trained and certified technicians. It is important that the correct type and amount of oil and refrigerant is used, otherwise damage to the vehicle and personal injury may occur. When the amount of refrigerant is low, the performance of the air conditioning is reduced. Overfilling also has a negative impact on the air conditioning system. Therefore, if abnormal operation occurs, have the system inspected by an authorized HYUNDAI dealer.